It has been 34 years since I started riding to school on my bicycle. 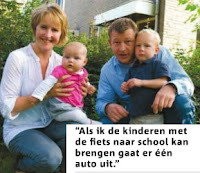 A big change in the life of any Dutch child is going from primary school to secondary school. Primary schools in the Netherlands are usually at walking distance. In my days we even walked there unsupervised. Nowadays kids are usually taken by their parents on foot, by bicycle or indeed by car. But once the kids start secondary school –usually at the age of 12– it means they will be going there without supervision and on their bicycles. Then as well as now. I looked up my old school diary and I had only written ‘first day at school’ on Tuesday 16th August 1977. My parents didn’t send me unprepared. They had carefully plotted a route for me. In the mid and late seventies cycling was as its all time low in the Netherlands and although cycling infrastructure was there, it was fragmented and you needed to plan to be able to ride a route that was as safe as possible. ﻿So my parents planned a route around the city centre and along busy streets. That last bit may seem odd but it isn’t. In the 1970s traffic calming was not common yet, but the busy main streets outside city centres did have separated cycle paths or lanes and my parents wanted me to be on those. So we had spent several Sundays trial riding the route together. I had to prove I knew the route well and they were also monitoring my behaviour around traffic carefully. Giving me hints and tips. I have cycled unsupervised from then on. With but one exception. One afternoon my mother suddenly showed up with the family car, worried by the first Autumn storm with heavy rain and wind. Right in front of the school, she put my bicycle in the trunk of the car to drive me home. It was with the best intentions but all my class mates were laughing and I urged my mother never to embarrass me like that again. She didn’t. I hadn’t seen my old home for years, but recently I rode the route again. Not much had changed! The biggest difference was that a level rail road crossing was now a tunnel. But apart from that little else has changed. Some of the infrastructure seemed old fashioned and one junction is clearly not up to present standards. Riding along the busier streets and on old fashioned cycle lanes is unpleasant. You couldn't call the route dangerous, but you can argue if this is still the best route to take. Cycling the safe route my parents had planned for me 34 years ago. ﻿That route also meant I had to take a detour. So after some time I rebelled and started following a shorter route right through the city centre. It meant negotiating with heavy traffic, smelly buses that took your breath away in narrow streets that also were full of cars and trucks. Motorised traffic was more often standing still than driving. I decided to ride that route again too. And surprise: almost everything in the city centre has changed! that my parents did not allow me to take 34 years ago. Motorised traffic was diverted around the centre. Streets became one way to make through traffic impossible. Whole areas of the city were transformed into 30km/h (18m/h) zones, making the streets unattractive for through traffic. Bus routes were diverted and cycle paths have been created. The most striking difference is the street in the picture below that I had to cross: in 1977 still a four lane main route, now (and since a long time already) not accessible for private cars anymore, only for buses and bicycles. The whole route was much more pleasant, since you see so little motorised traffic. The route that was more dangerous in the 1970s is the more pleasant and safer route now. And it is also the most direct route. The same street in the 1970s and now. From four lane major route to a street that is completely closed to private motorised traffic. So what can we deduct from this? Traffic calming (diverting and slowing down motorised traffic) can do a lot for cycle safety too. Especially if those traffic calmed areas are connected with good and direct cycle paths where they are needed. Once there are cycle provisions in streets they won’t be changed much, not even if the provisions are not up to standard anymore. If sub-standard cycling infrastructure is being built. You might be stuck with it for 30 years or more. (Because) streets that do not have any provisions will be updated first and they may become even better than the earlier updated streets. Routes to school. In green the longer and safer route in 1977, mostly following main arterial roads since they already had cycle provisions. The red and more direct route stays well away from arterial roads and is now more pleasant since it goes through an area of the city that has been mostly closed to motorised through traffic since 1977. Link to a google map with these routes. The explanatory captions on this video are only visible if you watch the video on a computer and not on a mobile device. Another video provides a different view of this bridge. The Korrebrug, or Gerrit Krol-brug, is the busiest bridge for cyclists in Groningen. Over 14000 cyclists pass over this bridge every day. We took last week's study tour to see the bridge. can be used to cross without waiting. It's a good example of the Netherlands going to extraordinary lengths for cyclists. It's over a busy shipping route to the city, so sometimes, this bridge has to open to let ships through. This caused a huge tailback of bicycles each time it happened until the council came up with an excellent solution. to climb the other bridges. Two smaller bridges (one for each direction of travel) we provided in 1995 to allow cyclists bypass the main bridge when it is open. They are higher, and require taking your bike along wheel guides over steps, but of course they are optional to use. If you're in a hurry, take the smaller bridges. If you don't mind waiting, are transporting a heavy cargo on your bike, or don't want to or are unable to climb steps, wait a few minutes for the main bridge to close again. The main bridge is shared between drivers and cyclists. However, cars are vastly outnumbered by bikes. Drivers of course don't have the option of taking the smaller bridges in the event of the main bridge being open. This solution to a problem for cyclists is almost certainly unique in the whole world. During last week's study tour, I said this to a pair of youngsters who were unable to work out why people had come to take photos of their bridge, which they cross every day on the way to and from school, and which is utterly normal to them. Now let's go over that again. There was an existing bridge, already mainly used by cyclists. This has been bypassed by not one, but two, extra bridges, both of which are only used by cyclists, and then only for the few minutes of each day when the main bridge is open. And what does the world know about this ? Very little. There are lots of examples of exceptional engineering for cyclists all across the Netherlands. These things are planned and built without hype and fanfare. There are many cycle bridges in Groningen which would seem exceptional elsewhere, and that goes for all Dutch cities. Gerrit Krol is a locally born author. In 1998, he wrote a story "de oudste jongen" in which he revisited places where he went as a child. The opening passage of this story describes how when returning from a long cycle ride and passing the sign for "Groningen", he felt that it could just as well have read "Gerrit Krol" because he was now home. The bridge displays this passage on a plaque. Why this bridge isn't so important as you might think Exceptional infrastructure like this is always interesting to see, but what causes people to cycle in large numbers is the very tight network of everyday, but high quality, cycle routes. Just a short blog post. We had a great time this week showing around the good people of the Cycling Embassy of Great Britain (plus Patrick Morgan from the Cycling Advocates Network in New Zealand). Standing where there used to be a car park. Marvelling at the width of a single direction cycle path through a village part way between Assen and Groningen (it's the same on the other side of the road). Watching the action at a simultaneous green junction. Reading through books and the evening presentation. Joe Dunckley caught primary school children at lunchtime in Assen. It's not the same school as we videoed before. They're all like this. Others have also already written about the tour: Sally Hinchcliffe (and again), David Arditti (and again), The Cycling Embassy of Great Britain (Day 1, 2, 3), stabilizer's photos, and through twitter. On the study tours, we show what everyday cycling really looks like with the quality cycling oriented infrastructure of the Netherlands. We don't cherry-pick good locations because there is no need to. It's very simple: people make a huge number of journeys by bike because the infrastructure makes it possible with a feeling of subjective safety which is not rivaled elsewhere. The study tour busts myths about the Netherlands. There is no one-size-fits-all solution. A good solution can be found in every location, from the oldest streets through to the newest. It's possible to achieve a similar cycling environment everywhere, but this requires that you really want it and will work hard towards it. This is the second larger study tour which we have held this year. A little earlier in the year we did a tour with a group of Australian visitors. A healthy cycling climate is not only about safe and protected cycling infrastructure. That there is much more to it sometimes becomes unexpectedly clear. In a newspaper article about moving to a different home a Dutch couple explains what their motivations were. They tell us that among other things their wish to move from The Hague to Leiden has to do with the commuting distance. Both work in Leiden, go to sports clubs in Leiden and they have friends and relatives there. The wish to be able to cycle to school as one of the reasons for moving to another home. That is a sign of a healthy cycling climate in a country. Even if the underlying reason here is also to save money, cycling is considered a sensible solution to achieve that goal. And cycling is an important factor in choosing where you live for many people in the Netherlands. They try to live at cycling distance of their every day destinations and a railway station to combine the bicycle with the train to cover longer distances. Home builders know about this too. 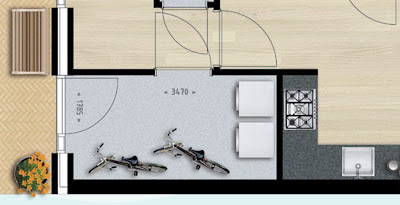 When they advertise new homes it is clear they show what potential buyers want to know: ‘where can I keep my bicycle?’ The artists’ impressions show exactly that. Artist impression of a two bedroom home in the Netherlands. 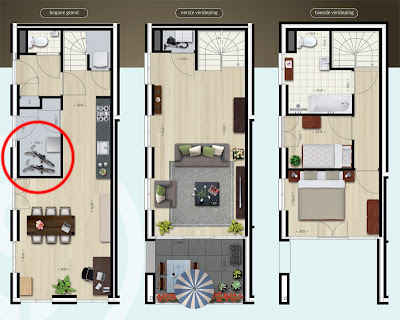 In the red circle bicycle parking with a separate entrance to the street. Parking your bike becomes very convenient like this. ﻿When considering cycling as good alternative transport it is not only necessary to be able to reach your destination safe and conveniently by bicycle and to be able to park your bicycle at that destination, it is also necessary that you are able to keep your bicycle stored well where you live. Detail of an in-home room for parking your -every day- bicycles. Also with a direct exit to the street right next to the front door. When a society facilitates all this it changes the mindset of people and they can choose for the bicycle with confidence. 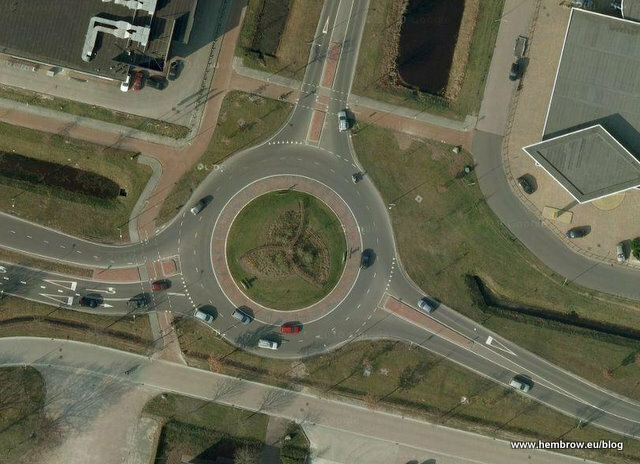 Every Roundabout in Assen. Variations of the safest roundabout design. 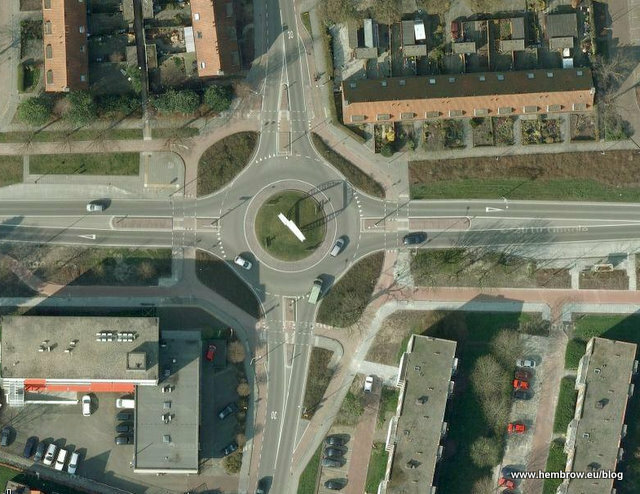 Every roundabout in Assen has cycle facilities which mean that cyclists don't use the road on any of them. Their designs vary quite widely depending on context but they have common features which make them safe and they all examples of good practice. 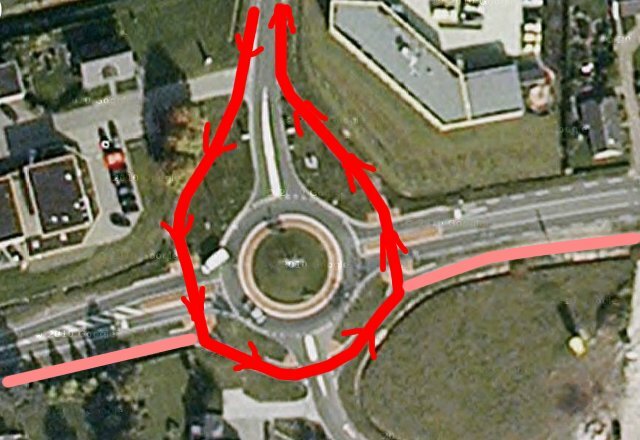 In this blog post I show what all of these roundabouts look like. 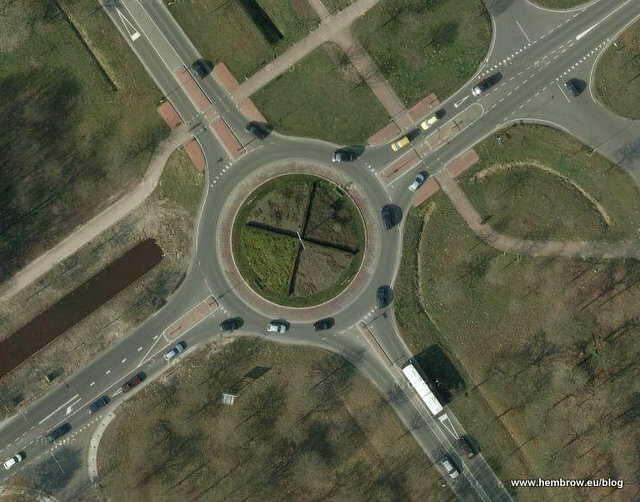 The roundabouts of Assen have a particularly good safety record: there were just two cyclist injuries over five years at all twenty-one of these roundabouts combined. 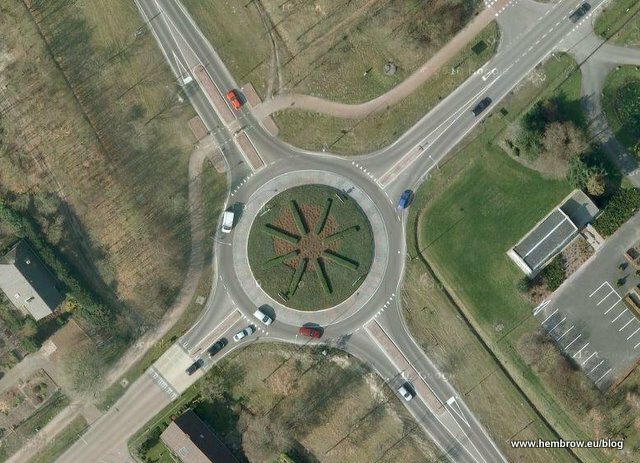 This is why Assen's roundabouts make a good example for other nations and even for other cities within the Netherlands. 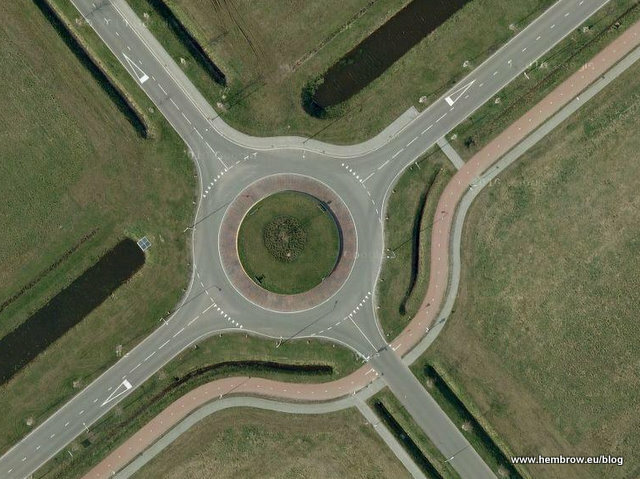 Here are aerial shots of all the roundabouts in Assen. The images are taken from Google Maps. If you're interested, you can look for them, with their context, yourself. Roundabout on ring road. The underpass from South West to North East, nearly as wide as a road, provides direct cycle access to the city centre without having to stop (previously seen here). The cycle path is four metres wide, and next to it (barely visible in the picture) is a two metre pedestrian path. The North-South road is the ring road around Assen. Cyclists are not permitted to use any of the roads in the picture, so not having access to them is not a problem. Going through the underpass is in any case quicker than going around the roundabout. See what the experience is like for cyclists at this roundabout in this video. No crashes of any kind in five years, no injuries. North of the city, this roundabout connects the motorway junction with the direct road North. High quality cycle paths go in all directions except onto the motorway. The paths heading North are unbroken for 5.5 km to and through the next village. They have an especially smooth concrete surface which has priority over all side roads and are well separated from the road to and through the next village. At this point there is no pedestrian path as there is little pedestrian traffic. The few people who make this longer walk use the cycle-path. Over five years, there was one incident here where a driver left the road and hit a piece of street furniture. No injuries. In a new and as yet undeveloped industrial area, the cycle (red) and pedestrian (grey) paths don't provide access to the road to the North East - towards the motorway junction. Zero incidents. Near "big box stores", a combination of cycle paths, and service roads provide easy access by bike, while pedestrian paths provide routes for pedestrians. Cyclists are required to cross two lanes at once in the bottom left corner of this roundabout and this makes it one of the less easy roundabouts to use by bike. There have been a number of motor vehicle collisions here, two cyclists involved in crashes, one of them injured. Near an industrial area at a ring road crossing. Cycle paths provide for all directions except along the ring road which is closed to cars (there are other routes for bikes). One incident here in five years - a driver left the road and collided with street furniture. No injuries. The ring road is intersected by direct cycle route to the centre of the city from outlying villages. No recorded incidents here in five years. Busy road to the East within a residential area. Cycle paths go in all directions around this roundabout, merging with 30 km/h roads to the North and South. Four crashes here in five years, one motorist injured. No cyclists involved in any crash. Industrial area. Cycle path approaches from the North, access road continues safe access to the South. To the East is a motorway junction. No cycle access there. No incidents here of any type. A junction on the ring road by which cars bypass the older direct route to Assen. No need for bikes to use the road West to East here as this is merely a bypass of the older and more direct route a little further North which remains open to bikes but is no longer usable by car. This roundabout has an extra lane which allows drivers to go from west to east without giving them the option to turn left. This combined with the requirement that cyclists cross two lanes at once makes it more difficult for cyclists to use safely. 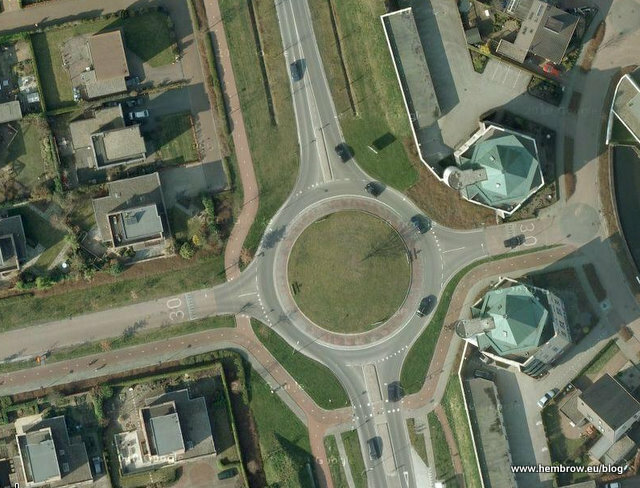 Happily it is not quite so bad as a turbo roundabout, and it is in any case not a heavily used junction by bike. Three crashes here in five years, none involving injury to drivers, none involving a cyclist. Junction inside residential area. Note that large "30 km/h" signs on the residential streets s are visible, as are cycle paths in all directions. 30 km/h roads sometimes have separate cycle paths. No incidents here in five years. 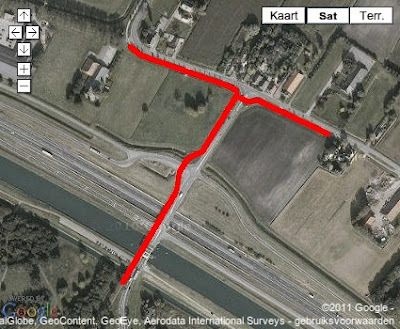 On the western edge of Assen, motorists are now directed to the south instead of continuing along the canal. The old direct route into the city alongside the canal remains a through road by bike but not by car. Two crashes here in five years, no injuries to drivers, no cyclists involved. In a new housing development, cyclists mostly travel South to North-West or North-East. An extra access is provided for people who live on the West. One crash between cars here in five years. No injuries. No cyclists involved. An asymmetrical arrangement. The main route is North to East, so the cycle paths are not the same on the west wide. One crash between cars here in five years. No injuries. No cyclists involved. In a new residential area, the road to the south west has a 30 km/h speed limit and is relatively lightly used. No crashes here in five years. Residential area, cyclists can more easily access homes than motorists can. No crashes here in five years. A direct route to the new suburb on the west of Assen is provided here. The road to the North East is access to a natural gas extraction facility and does not need cycle access. No crashes here in five years. This area to the West is as yet mostly undeveloped. However, the roundabout has been built in preparation for cycle traffic which may appear in the future. No crashes here in five years. Where the ring road passes close to a residential area and a route out of the city to the North West, a cycle path provides for the only direction that cyclists need to go in this location. Seven crashes here in five years, and one cyclist injured. Compare with the first example where grade separation prevented any cyclists being injured on a crossing of the ring-road. Between residential areas on the West and the centre of the city, this roundabout is one of the busiest in Assen for cyclists, provides good access by bicycle and has proven to be very safe. Four "fender benders" here where motorists have shunted each other. No injuries, no cyclists involved. Another blog post expands on this this very safe roundabout design detailing all the design features which make it work so well. Update 2014: I forgot this one too. Near a large bus-stop with much cycle-parking, it serves many buses as well as many bikes. It's on the main route North from Assen, but as the majority of the traffic travels in a tunnel this doesn't affect the roundabout. This is the site of three collisions in five years, none causing injury and none involving a cyclist. This is a small "roundabout" in a residential area. All streets have a 30 km/h speed limit, and are arranged so as not to be through roads for drivers. However, it's not equivalent to the others. These roads are not for through-traffic. This is an example of segregation of modes without cyclepaths. The same rules do not apply. Take a look on streetview. This roundabout had no incidents of any kind in five years. 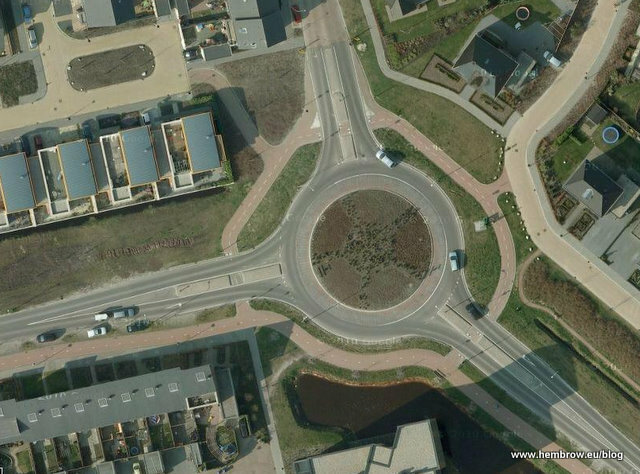 On this side of the North Sea, cycling facilities are not an optional extra to be omitted at any time that it's a little difficult to work out what to do, but a fundamental part of the design of roundabouts - just as with everything else on the roads. To design a Dutch inspired roundabout adopting only the geometry but without cycle paths, as I've seen proposed in the UK, is to very fundamentally miss the point. This is just one of many ways in which what has been achieved in the Netherlands has been misinterpreted elsewhere. For cycling provision to be able to influence peoples journey choices and encourage a high modal share for cycling, it must be universal and consistent. This way you get adequate subjective safety so that people will cycle. It is never too late to start building such a network, and it won't take as long you think. Think these designs won't fit your town ? Roundabouts are only safe for cyclists with relatively low traffic flows and relatively good sight lines. 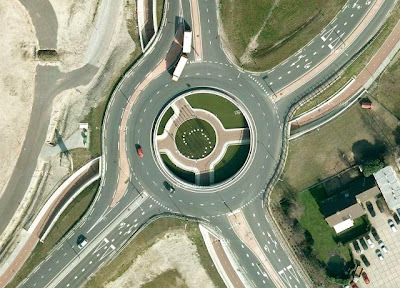 If you have roundabouts in locations where these roundabout designs wouldn't fit, it's quite likely that those junctions wouldn't be roundabouts at all in the Netherlands. Please read a companion blog post which shows every traffic light junction in Assen, many of which are of the the simultaneous green design - the safest traffic light design for cyclists. This may be a more appropriate design for your location, as could be an attempt to unravel routes. 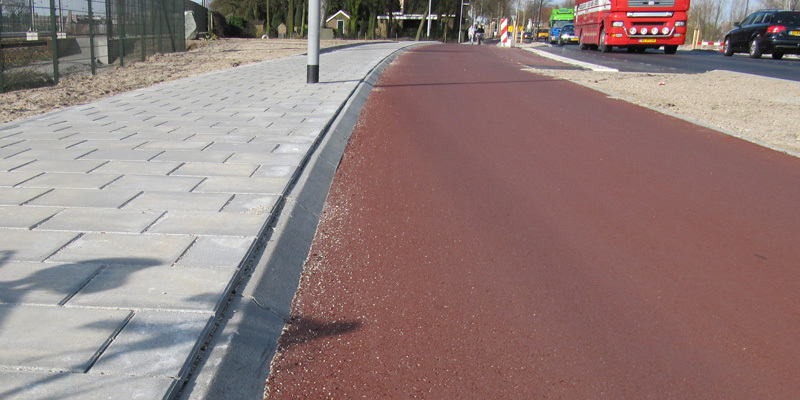 In Assen, cyclists do not have priority where cycle-paths cross roads approaching roundabouts. This has been shown to be safer than the design used in some other parts of the Netherlands where cycle-paths have priority over the road crossing. Whether or not to give cyclists priority has long been a contentious subject because of this balance between safety and convenience. There is a big contrast between the safest designs and the least safe. 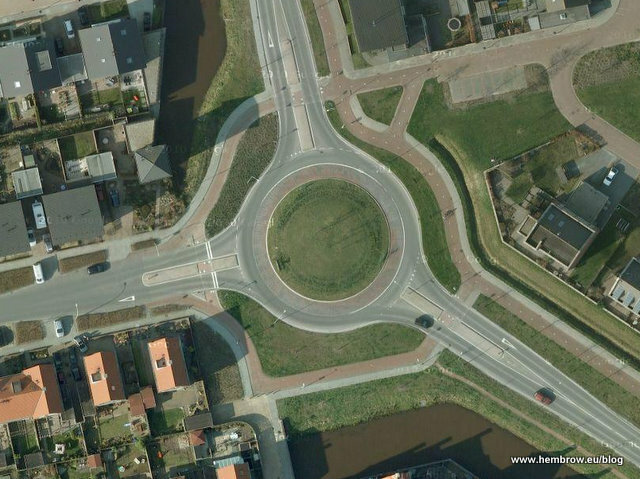 Since this blog post was written, Assen has built one new roundabout in a residential area which is very similar to the tenth example above complete with similar cycling infrastructure and begun construction of a turbo-roundabout. Turbo roundabouts are a special kind of roundabout designed to deal with high volume of motor vehicles. They are not intended to be used by cyclists. 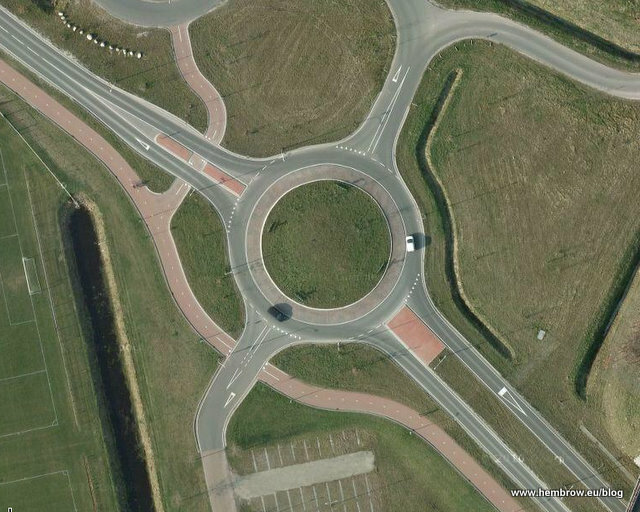 Assen's new turbo roundabout is being built to cater for a new motorway junction well away from any cycle routes. It is not easy even to approach by bike. Crossing the arm of the roundabout shown at the top in the map segment above. Note that a few rough bricks which give the appearance of a central reservation just half a metre wide are absolutely no barrier to the tyres of a truck. This arrangement does not seem safe, particularly at a busy location for both cycles and trucks. This location is a junction between a main cycle route west-east and the entrance to an industrial area north. In the past, there was a cycle-priority junction here which had effective devices to prevent motor vehicles from cutting the corner and it had a perfect safety record so far as cyclists were concerned. This roundabout is too new to yet have any statistics associated with it. 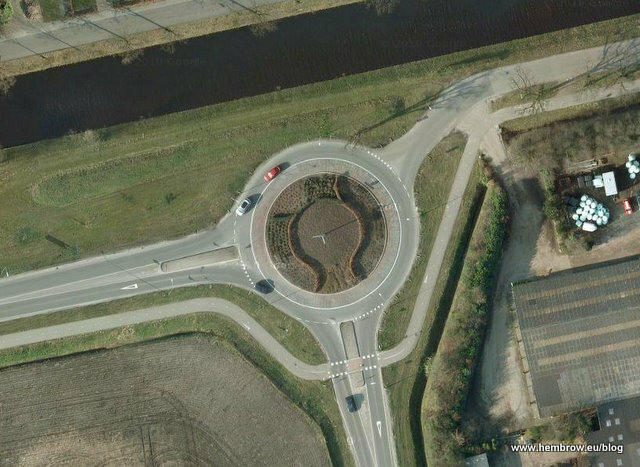 Outside the city, another turbo roundabout has been constructed south of Assen, again this is not intended for the use of cyclists, and other roundabouts of the safe design for use of cyclists have also been constructed near the TT track. Roldestraat runs left to right across the image. On the right is the entrance to a tunnel which dates from the 1960s. On both sides of the road there are 2.5 m wide bidirectional cycle-paths. These are the narrowest bidirectional cycle-paths in the city, their width being a consequence of their age and the huge expense of rebuilding a tunnel. All other cycle-paths are either 2.5 m wide for single direction cycling or 3.5 m or more for bidirectional cycling. 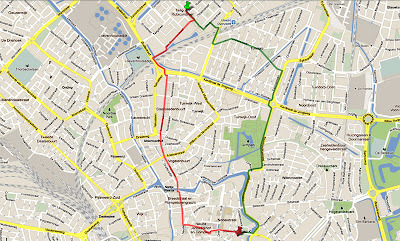 Cycle-paths for single direction travel in red, bidirectional in green and bidirectional crossings in blue. Note that this design never requires any cyclist to cross the road more than once. The most awkward part of the design is a consequence of the layout of these roads: Cyclists coming into the city (right to left) who have passed through the tunnel will have to make a sharp right turn before turning left to cross the road to continue into the city centre. This is slightly awkward but should be safe. Cyclists heading out of the city left to right will be able to cycle straight through without stopping at all. Note that cyclists do have priority over the road to the south, but this will not be busy: It is to become an exit only for cars from a few residential streets. Overall I think this is a very good redesign of this junction. It's slightly inconvenient for cyclists heading from east to west, but safer than the existing situation. For cyclists heading west to east it's both more convenient and safer. Use of bidirectional cycle-paths helps to reduce the frequency with which cyclists have to cross the road, which is when they are exposed to danger. Overall this is a plus for Assen cyclists. 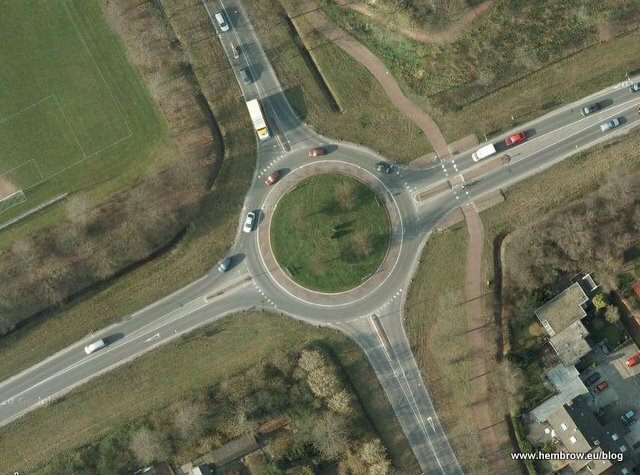 I recently had an online conversation with a planner in Bedfordshire in the UK who was designing a "Dutch style" roundabout using Dutch geometry but with no special cycle facilities. To me, this sounds rather like making a cheese sandwich without the cheese. 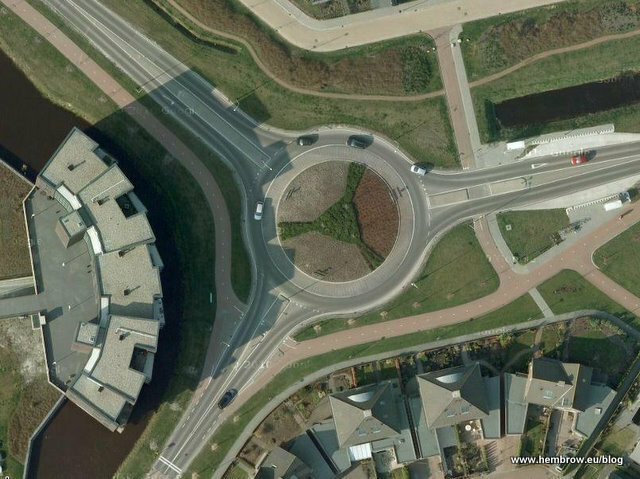 The reason why Dutch roundabouts are designed as they are was being missed on a very fundamental level by this planner. The reason stated not to include cycling facilities was that a short way beyond the roundabout, cyclists would have to join the road again. This is inevitable, of course, in the current situation because you can't do everything at once. However, it's not a reason why the right thing shouldn't be done at the junction which is being redeveloped. My correspondent asked for examples. 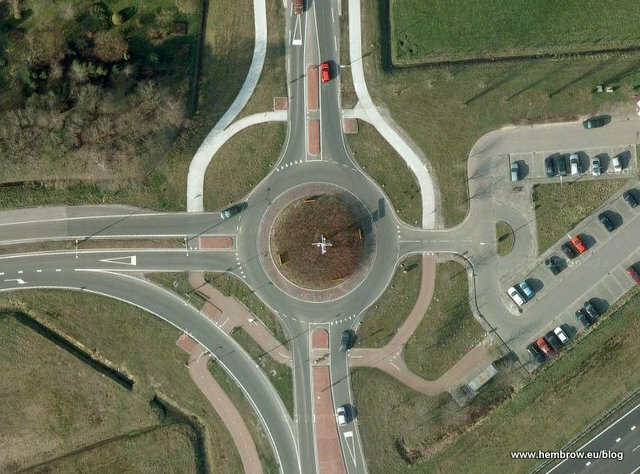 Between the explanation in this blog post and my next blog post also written for this planner (showing all the roundabouts in Assen), it should be possible to gain a reasonable idea of how Dutch roundabouts work, though obviously not as good an impression as would be gained from coming here to take a look. 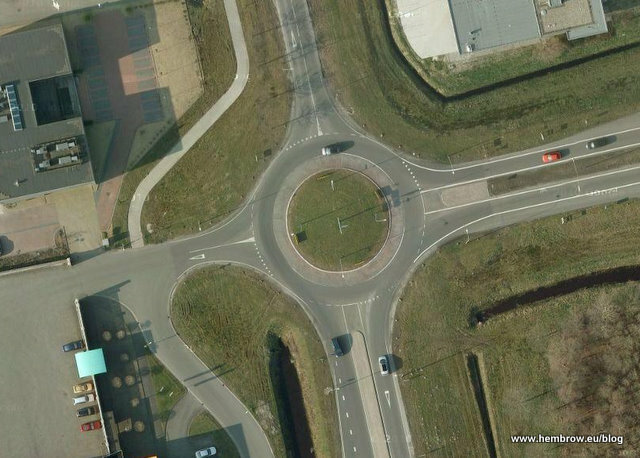 In reality, the difference in experience for a cyclist using a Dutch roundabout and a British roundabout is not just the geometry. Specific cycling infrastructure is an integral part of roundabout design and that is what makes cycling so much safer and more pleasant on Dutch roundabouts. 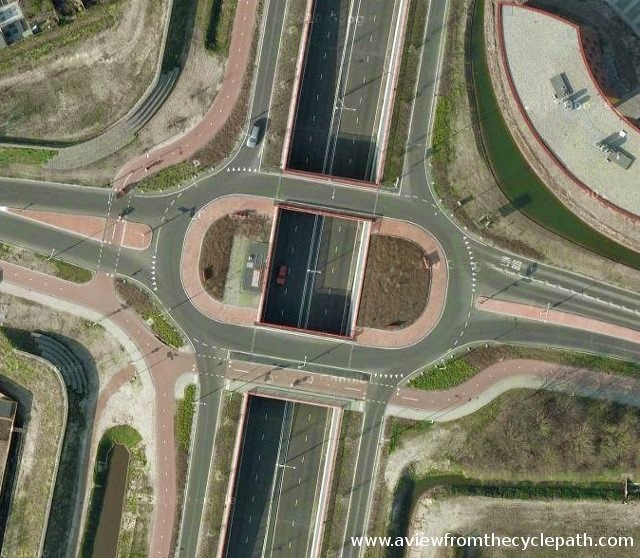 It's really not the same at all to take the geometry of Dutch roundabouts without also including the cycle facilities which go with them. Even where there are no cycle-paths on adjoining roads, there is still an advantage to having them around a roundabout. There is a big safety advantage as well as a potential improvement in convenience to well designed junctions, including around roundabouts. I've not found a roundabout locally with no cycle facilities at all. However, this one in a village a few kilometres North of the city provides a good example of how to link a road without cycle-path to a roundabout with cycle-path, preserving safety on the arm of the roundabout which doesn't have a cycle-path. Note that this video includes explanatory captions which are only visible on a computer and not on a mobile device. Some may quibble at having to give way at the crossing of the other roads joining the roundabout itself. However, consider that if I didn't give way where I do in the video, I'd otherwise have done so to the same car on the roundabout itself. In practice, most usage of this junction by cyclists is on the main West-East cycle-path which we join very briefly on our way around the roundabout. Because the road to the South serves only a dead end road with one business and a farm on it, there is rarely anything to give way to. The only way to have to give way twice is to ride around the roundabout in order to make a video. The industrial area just North of the roundabout does not have segregated cycle paths, but just cycle lanes on the road. In the Netherlands, this is quite unusual. There are 29000 km of cycle-path separated from the road, but just 5500 km of on-road cycle lane. However in a location like this, with a 30 km/h speed limit on a road which mainly serves adult cyclists, this is adequate provision. 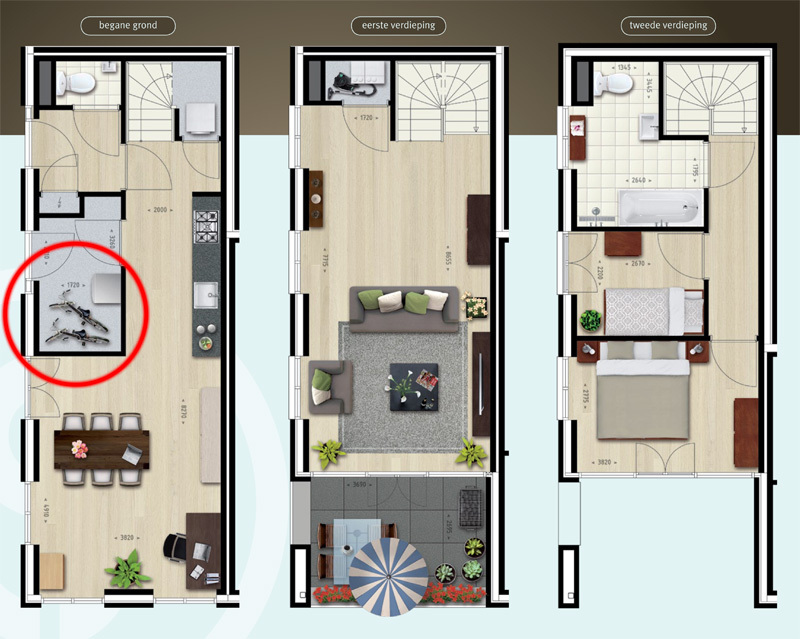 The direction travelled in the video is shown by the red arrow. The pink lines are the other cycle-path which we intersect. These provide the main West-East route for cyclists. The road to the South serves one business and a farm. It doesn't offer a through route by bike or car. The reason why the Netherlands has a comprehensive network of good quality cycling infrastructure and the UK does not comes down to two things: They made a good start, and they've continued with the effort to make things better. What exists here now wasn't all built at once. Rather, isolated islands of infrastructure were built and eventually they came to be joined up to make the current network. The best approach in Britain to be to insist on building examples of the best possible infrastructure rather than taking the approach that it's not worth doing something because it isn't already done elsewhere. It is inevitable that in the UK at the moment good examples will be isolated islands. The important thing is to make sure that those isolated islands are of good quality. Good things sell themselves. 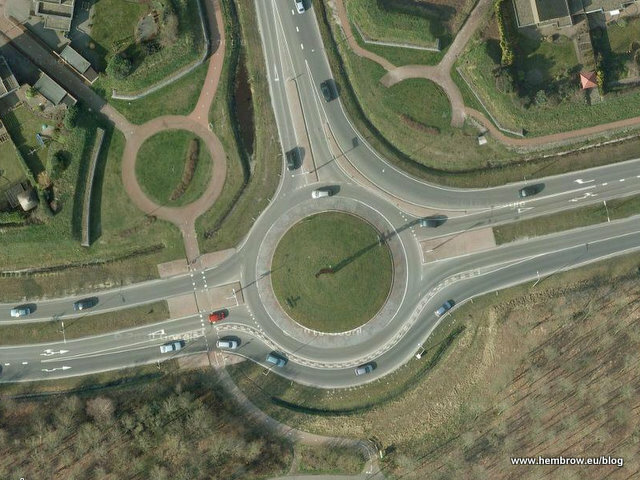 Once something has been shown to work well, as Dutch roundabout design including cycle paths certainly do, then it is easier to make a case for more of the same elsewhere. I deliberately did not name "the planner" who inspired this blog post more than three years ago because my communication with him had been anonymous. Our correspondence was entirely online and unfortunately was rather repetitive because he was struggling with the concepts of Dutch roundabout design. Many emails were sent, many examples given and I made the suggestion that he should come and take a look at real Dutch infrastructure before going ahead with building the flawed design which he was proposing. Three years passed. That's more than enough time to have thought through and improved the original design. 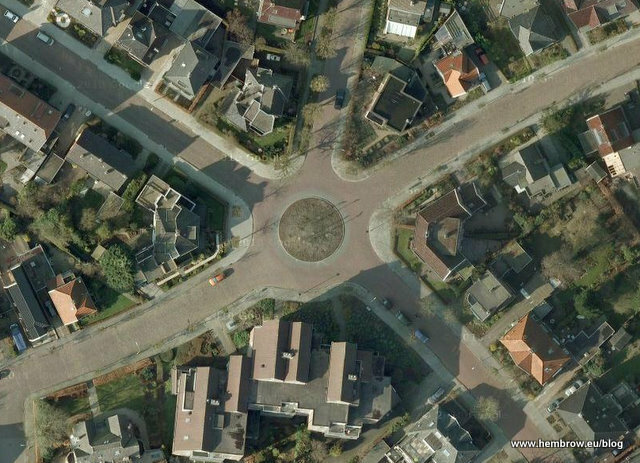 More than enough time to have come to find out how the Dutch really design roundabouts. Unfortunately, neither of these things happened. The same planner has recently designed and got built a roundabout for Perne Road in Cambridge which is almost exactly as he'd suggested he would build in Bedfordshire three years ago. It took just a few days for this dangerous design to cause injuries. "The planner" actually boasting about his design online, so I see no reason why I should not now name him as Alasdair Massie. 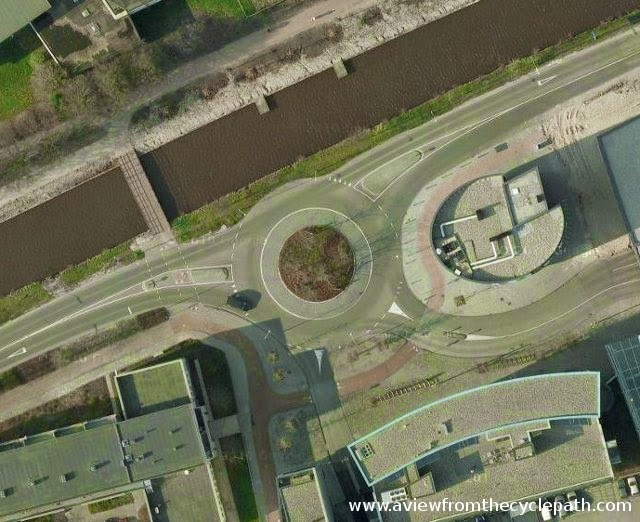 This blog post and the the following one showing how all the roundabouts in Assen have cycling infrastructure, were both written as part of my attempt to provide Alasdair with a free education about how Dutch roundabouts are really designed. I wanted to help him not to make the mistake that he has made, to try to avoid people being hurt by a bad design. Unfortunately, some people simply won't listen to advice. 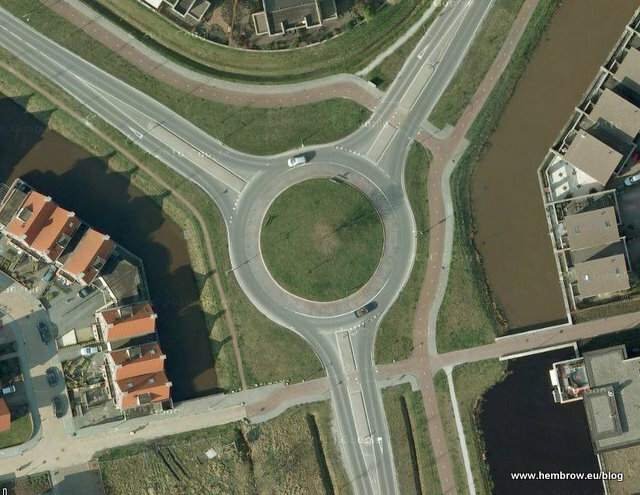 More recently I have described how the safest Dutch roundabouts are designed. 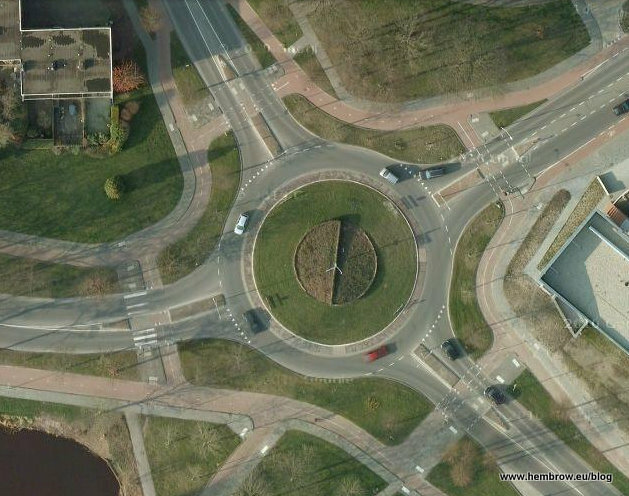 This is the blueprint for how roundabouts in other countries should be designed. We are still available to show planners from the UK, or other countries, what true best practice looks like. We offer Study Tours in the Netherlands in order to provide a service to campaigners, planners and other parties with an interest in how the Netherlands has achieved its extraordinary modal share and safety figures for cycling. Uniquely, we've experience of both the UK and the Netherlands and know how the two countries compare from a cyclists point of view. We offer a time-saving way of finding out what the important differences are, rather than having people making guesses from the other side of the North Sea. Thus far, no-one responsible for designing cycle provision in the UK has come on any of our tours. In the past, people have asked me why it is that there is so little litter on the streets and cycle-paths in our photos and videos from Assen. They're not completely clear of litter but they are swept regularly which helps a great deal. But in general you see little litter because in comparison with other places that I'd lived, relatively little is dropped here. In part this comes by providing somewhere to put it. Cyclepaths have bins on them, into which most litter from children and teenagers gets thrown (some miss, of course, so you also see some next to these bins), and that helps a lot. rest is on the ground. However, the area around this particular fast food restaurant is a bit different. My commuting route passes quite nearby and I've often seen what people do after going through the drive-through: The car window opens, and out comes packaging and quite often food and drink as well. I can only assume that people find it isn't quite so tasty as the advertisements suggest is is. I don't understand why people do this, but reading around the internet leads me to believe that throwing stuff through car windows is a common reaction world-wide to buying food from McDonalds. In my opinion, it's a very good thing that McDonalds is located only in the outskirts of the city and not in the centre. While this results in litter reaching in a line from where the fast food is bought along the cycle-paths to where it is consumed, this at least indicates that many of the people who buy and eat this stuff are actually getting some exercise at the same time. 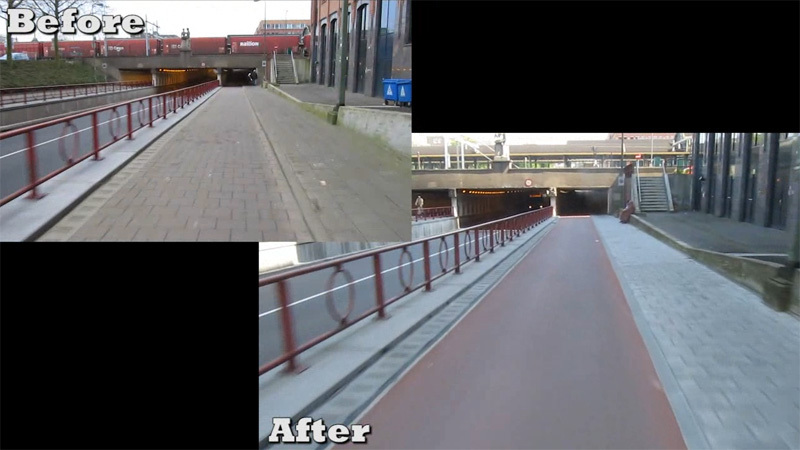 In an earlier blog post I have shown you examples of changes to the cycling infrastructure of 's-Hertogenbosch. The city has started a city wide update of the cycling infrastructure in 2009 under a six year plan. Almost three years into the plan it is becoming very clear all over the city that the update was not just mere talk and paper plans, no, there really is a great change for the better becoming visible. Below I will show you two more examples. Missing link: this narrow old path formed the missing link between existing wide cycle paths. The route -away from motorised traffic- has now been completed. A main cycle route from the North-East connects a suburb to the centre of the city. Many commuters and school children cycle this route. There was one piece 'missing'. Of course it wasn't really missing but it was not up to the latest standards. It was too narrow and the surface was really bad and needed a good makeover. This was done and now the route is complete. The cycle route now has priority on every junction. This means that cars that merge into the part of the route that is shared space have to give priority to cyclists already on the cycle route going straight on. For that some junctions were changed in such a way that this priority is clear. The cyclists go straight on, motorised traffic has to merge and swerve, not the other way around. Comfort and safety comes from details. A smoother asphalt and a 'forgiving kerb'. The last example shows that quality improvement is in the details. 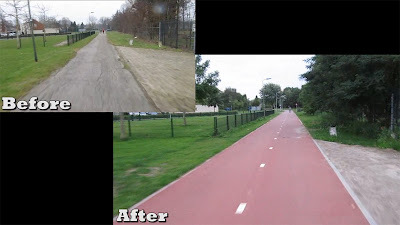 The 'only' difference is that this cycle path got a new surface. Both at the beginning and end of the video the connecting cycle paths already had smooth red asphalt. The cycle path in between still had an older type of surface: concrete tiles. The smooth red asphalt is now continuous. Another thing that was changed was the kerb. It is now less likely that cyclists accidentally riding onto the kerb fall, because of the new type of kerb. Closer look to a 'forgiving kerb'. It has a shallow angle. Less dangerous than the older kerbs with a more common 90 degree angle. A cyclist accidently hitting this new type of kerb is less likely to fall. With all the updates 's-Hertogenbosch was chosen as one of the five nominees running for cycling city 2011 in the Netherlands. I have reported about this before. The final decission will be made in November by an expert jury but there is also a popular vote in which the city is not doing well. 's-Hertogenbosch is now in a shared 3rd position and when you look at the before and after videos you will have to agree that that is clearly undeserved. 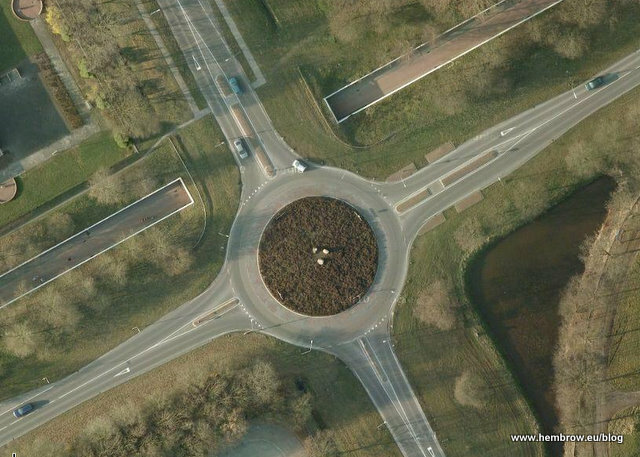 Our local paper recently carried this photo of a new roundabout near Winschoten. It's called the Blauwe Roos (Blue Rose) and is required to provide better access for drivers going to the new development of Blauwe Stad from the busy A7 motorway. The motorway runs left to right (roughly west to east) at the lower edge of the photo. Cycle paths highlighted in red. The top horizontal part in red is actually a service road for those few houses but doubles as a cycle route. Cyclists have not been ignored. Along with making sure that the existing cyclepaths still join up, a new cycle tunnel was constructued as a part of creating this roundabout. Cyclists have absolutely no need to go anywhere near the motorway exits and busy roads. Despite this being a large road junction, subjective safety for cyclists is preserved. School children can, and will, use this route. The changes have resulted in there being two crossings for cyclists instead of one on the route from west to east. However, the busier route from west to south, between the new development and the existing town of Winschoten, now has no crossings instead of one. From East to South, there remain two crossings, the same as before. Overall convenience for cyclists has not been adversely affected. Google Maps aerial photography still shows the old situation, with a crossing of the motorway junction for cyclists heading from the new large residential area at Blauwe Stad to the existing town of Winschoten. Google Maps streetview has some images of the new situation. For instance, this view from the bridge at the South shows the cycle-path connected with the new tunnel to the west which keeps cyclists from having to cross a motorway exit. Here is one of the level crossings of cyclepath and road. While cyclists have to give way here, the junction design includes a safe refuge in the middle so that it is only necessary to have a gap in motor traffic in one direction to start crossing. Crossing just one lane at a time greatly improves safety. Also, the road design makes it very obvious to drivers that cyclists will use this crossing, and the cycle crossings also form traffic calming features which should slow traffic and reduce the noise nuisance for people who live nearby. Note that the road rises at this point to cross the cyclepath while the cyclepath continues on the same level across the road. Here's another aspect of the works that is appreciated locally. Three 80 year old trees had to be moved to build this need development. However, they weren't just chopped down but have been relocated to the centre of the new roundabout so that they remain a part of the landscape. Sometimes large works are required for the benefit of drivers. However, when this happens, there is no reason why conditions for cyclists should not also be improved at the same time, nor why conditions for local people should not be preserved as well as possible. 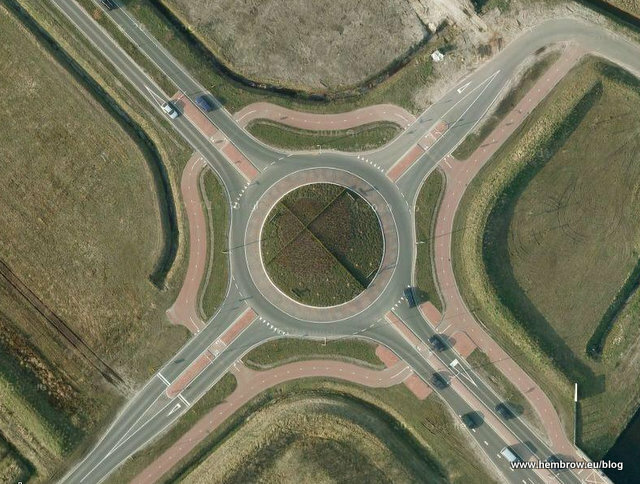 There is a fundamental point about Dutch roundabouts which continues to be missed elsewhere. It's not just the geometry which is important, but cyclists need to be kept away from motor vehicles. This is often missed when attempts at building "continental style" roundabouts are made elsewhere.